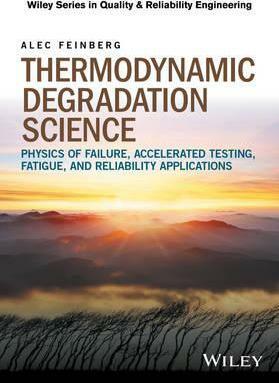 Thermodynamic degradation science is a new and exciting discipline. This book merges the science of physics of failure with thermodynamics and shows how degradation modeling is improved and enhanced when using thermodynamic principles. The author also goes beyond the traditional physics of failure methods and highlights the importance of having new tools such as Mesoscopic noise degradation measurements for prognostics of complex systems, and a conjugate work approach to solving physics of failure problems with accelerated testing applications. Key features: Demonstrates how the thermodynamics energy approach uncovers key degradation models and their application to accelerated testing. Demonstrates how thermodynamic degradation models accounts for cumulative stress environments, effect statistical reliability distributions, and are key for reliability test planning. Provides coverage of the four types of Physics of Failure processes describing aging: Thermal Activation Processes, Forced Aging, Diffusion, and complex combinations of these. Coverage of numerous key topics including: aging laws; Cumulative Accelerated Stress Test (CAST) Plans; cumulative entropy fatigue damage; reliability statistics and environmental degradation and pollution. Thermodynamic Degradation Science: Physics of Failure, Accelerated Testing, Fatigue and Reliability Applications is essential reading for reliability, cumulative fatigue, and physics of failure engineers as well as students on courses which include thermodynamic engineering and/or physics of failure coverage. Thermodynamic degradation science is a new and exciting discipline. This book merges the science of physics of failure with thermodynamics and shows how degradation modeling is improved and enhanced when using thermodynamic principles. The author also goes beyond the traditional physics of failure methods and highlights the importance of having new tools such as "Mesoscopic" noise degradation measurements for prognostics of complex systems, and a conjugate work approach to solving physics of failure problems with accelerated testing applications. - Demonstrates how the thermodynamics energy approach uncovers key degradation models and their application to accelerated testing. - Demonstrates how thermodynamic degradation models accounts for cumulative stress environments, effect statistical reliability distributions, and are key for reliability test planning. - Provides coverage of the four types of Physics of Failure processes describing aging: Thermal Activation Processes, Forced Aging, Diffusion, and complex combinations of these. - Coverage of numerous key topics including: aging laws; Cumulative Accelerated Stress Test (CAST) Plans; cumulative entropy fatigue damage; reliability statistics and environmental degradation and pollution. Thermodynamic Degradation Science: Physics of Failure, Accelerated Testing, Fatigue and Reliability Applications is essential reading for reliability, cumulative fatigue, and physics of failure engineers as well as students on courses which include thermodynamic engineering and/or physics of failure coverage. Alec Feinberg, DfR Software Company, Raleigh, NC, USA Dr. Feinberg has a Ph.D. in Physics and provides engineering services in all areas of reliability. He also provides consultancy services for: Reliability Test and Analysis, Accelerated Testing, HALT, FMEA, Quality statistics, corrosion analysis and Thermodynamic Modeling. Alec has presented numerous technical papers and won the 2003 RAMS Alan O. Plait best tutorial award for the topic, Thermodynamic Reliability Engineering.